Fernando Palma of Future Stable Studios had recently sent me this book for review. Megafuture features the concept art for sci-fi galactic cars and vehicles. What immediately comes to mind is another book I've featured before called DRIVE: vehicle sketches and renderings by Scott Robertson. 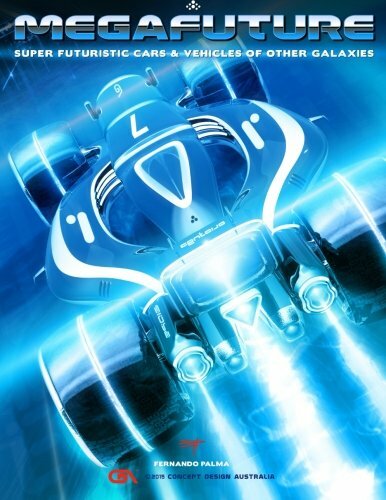 Both books feature futuristic car designs. The vehicles in Megafuture look wonderful. The designs are sleek, modern and have curves and gloss at the right places. The vehicles look 3D rendered to me. I like the details on them, such as the textures on the tyres, paint job, and the overall look. The colour scheme used, the lighting, is a bit too colourful to my liking as I would prefer a more muted approach. As alien lighting, it could be appropriate. The style and mood remind me slightly of Syd Mead. Other than vehicle design, there are also environment art, mostly included to give you an idea of where these vehicles come from. In terms of execution, the art is very well done. The only downside of the book is the gutter that makes it difficult to see parts of the vehicles. The designs printed across double pages are affected by the gutter. The layout would have worked better with a hardcover book that can lay flat, or just by not printed images across the gutter.